One platform for all technologies. CNG, diesel, hybrid and hydrogen vehicles. Next to the packages we offer for electric vehicles, we offer solutions for non-electric vehicles to support mixed fleets. After our DataHub is installed in your vehicle, we display real-time data and historical data for all your vehicles to assist in all aspects of your operation. Real-time data will assist your dispatch team in making sure your fleet is running on schedule. In case any technical errors occur, your team will be notified so that severe issues can be avoided. 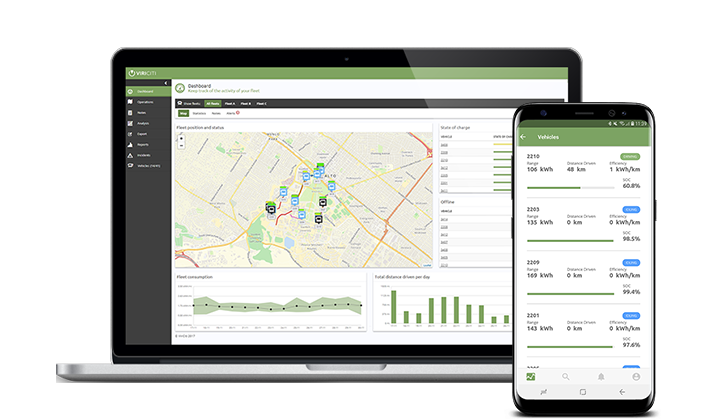 Historical data will increase efficiency and give you insights into how your drivers are impacting fuel usage and emissions. This way, you will be able to reduce the total cost of ownership of your mixed fleet. Smart Drive for CNG, diesel, hybrid, and hydrogen vehicles, tells you how drivers are handling their vehicles. It shows you in what aspects they can still improve, leading to a higher efficiency of your fleet. Based on key parameters, well-informed decisions can be made on what aspects to train your drivers. Lowering costs while improving passenger comfort and safety is what Smart Drive is about. The smart Drive package is only available with Basic operator package. Lower your maintenance costs through easy error detection and detailed insights. Get a real-time overview of all the active warnings and alerts in your vehicles, and have messages sent directly to maintenance. Real-time and historical detailed insights into customized parameters, after-treatment systems, the engine, doors, and more. The Maintenance package is only available with Basic operator package.